> When did Christmas become like it is today? This is going to be a rambling post, but here it goes. As a young boy and teenager, I did not mind the commercialization of Christmas, for I always enjoyed opening gifts at Christmas and cherished it as one of the greatest days of the year, one where my wishes for new toys, video games, clothes, candy, cash, and other great items came true. I would then spend the next week while off from school enjoying the gifts that I had received. It was always a highlight! Sure, as a Christian, I understood the deeper meaning of Christmas, that it was the celebration of the birth of Jesus Christ and enjoyed the festivities at church each year. But as I have grown older, Christmas has become complicated. Now, I have a hard time answering the question, “What makes Christmas merry?” It seems that America’s answer to this question would not line up with the biblical ideal. the background? “I’ve got you babe” by Sonny and Cher. Santa Claus’ other name – Saint Nicholas is based on the Christian bishop, Saint Nicholas of Myra who died in 346 A.D. He is famous for two things. First, he was a defender of Orthodoxy who in 325 A.D. at the Council of Nicaea, tradition holds that he punched the heretic Arius after Arius repudiated the deity of Christ. Also, and this gets more to the issue of Christmas, he was renowned for his charity to the POOR. He is especially well-known for donating money to three destitute, young women’s dowries so that they could get married, and thus he prevented them from a life of prostitution. The name of Santa Claus comes from the Dutch “Sinterklaas” which is a hybrid of the St. Nicholas tradition and the Norse myths surrounding the god Odin. 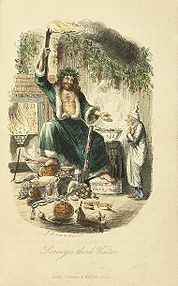 I recommend that you go to Wikipedia.com and research the origins of Santa Claus. 1. Remember that Christmas is a festival about the INCARNATION of CHRIST = God incarnate. This is the greatest event in human history. We should focus everything / filter everything around this central and glorious truth! Glory be to God! 2. Unapologetically say “Merry Christmas” to everyone – don’t worry about political correctness. 3. Celebrate the spirit of giving by investing your time in participating in charitable activities – especially giving to the poor or participating with organizations that do. 4. Celebrate your family! Spend time with your family! 5. Don’t get sucked into the commercialization of Christmas. Resist it. Give gifts with meaning and purpose. I am sure that there are many more tips and recommendations to make a Merry Christmas, but the greatest way to make this Christmas merry is to celebrate your relationship with Christ. The most merry Christmas comes with being a redeemed follower of the Christ who was born on the night that split history.